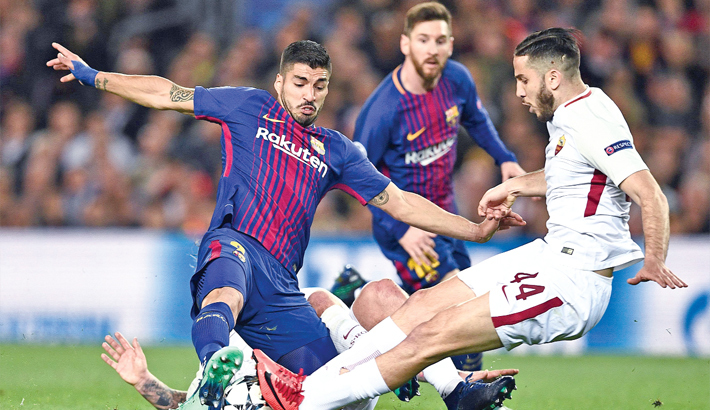 Roma Greek defender Kostas Manolas, right, challenges Barcelona forward Luis Suarez during their UCL quarter-final first leg match at Camp Nou Stadium in Barcelona on Wednesday. Barca won 4-1. Two own-goals, from Daniele De Rossi and Kostas Manolas, and a close-range finish from Gerard Pique, presented the Catalans with a flattering 3-0 advantage at the Camp Nou before Edin Dzeko snatched Roma a late away goal. But, just as the Italians looked to have grabbed a lifeline, Luis Suarez restored the three-goal cushion, by scoring a fourth in the 87th minute. It means Barca will head to Italy next week with a place in the last four firmly in their grasp but this was not a virtuouso attacking display. Instead, they benefited from two fortuitous own goals and some careless Roma finishing. Ernesto Valverde’s side are unlikely to meet as generous an opponent in the semis. Messi returned to the starting line-up after recovering from his hamstring complaint, as did Sergio Busquets, back after breaking his toe against Chelsea three weeks ago. It was Barca who enjoyed the rub of the green when De Rossi attempted to cut out Andres Iniesta’s pass to Messi. Facing goal, his leaping slide connected too well with the ball, which he stabbed past Alisson Becker and into his own net. Stodgy in the first half, Barca were sloppy at the start of the second as Semedo allowed Diego Perotti a free header at the back post and then Samuel Umtiti could have been punished for a moment of indecision in his own six-yard box. But Roma were blunt in attack and they paid the price. In the 55th minute, a skimming cross from Rakitic was met by Umtiti five yards out and while his finish came back off the post, the ball deflected off Manolas and in. Four minutes later, it was 3-0. Messi’s bending pass allowed Suarez a shot at goal and Alisson’s parry fell at the feet of Pique, who side-footed home. Roma looked to have found a way back into the contest when Dzeko nipped in to convert Perotti’s cross but Suarez secured the victory and perhaps the tie. His namesake Denis Suarez supplied the cross and as the ball spilled loose, the Uruguayan needed no second invitation to find the net.